Utah adrenaline junkies get their high-altitude fix mountaineering towering limestone and granite peaks, throughout the state. I’ve watched plenty on belay over sharp outcroppings in various canyons, often anxious to jump in myself. While no one who knows me would ever mistake me for a mountaineer, I’ve managed to traverse my way up several domestic and foreign peaks, shredding quads and breathing in scenic surroundings. So when a group of enthusiastic friends invited me along for a casual day of climbing in Ogden, I decided to tag along. Plus there were promises of post hike beers on Ogden’s Historic Main Street, I couldn’t pass up. The gig: To test out one of the nation’s few Via Ferratas. This one in Waterfall Canyon’s private reserve, 40 minutes North of Salt Lake, where climbing pioneer Jeff Lowe partnered to create a safe route for all climbers, with fixed anchors, steel cables and ladders. While many may not get the point of Via Ferrata — Italian for Iron Road or Iron Way — this is a safe way for non-expert climbers to reach peaks safely, or assist climbers with peaks in bad condition. Originally, strategically placed through the Alps in war time for troops to safely pass with gear through all weather, European Via Ferratas have become a bucket list item for many. With only four in the U.S., it’s no surprise Lowe decided to create one here. With the Spring equinox beginning to thaw the Northern Hemisphere, I was looking forward to getting out into warm weather and sun. We decided on a private group climb (approx. 5 hours, through Utah Adventure Center: $150 per person) and the six of us set off after a short training on the practice wall at the peak base. For the most part the trails weren’t crowded, and since Waterfall Canyon is privately owned, they require a guide to access their Via Ferrata routes, so our small group had the mountain all to ourselves. We piled into the small safari-style utility vehicle for a 10-15 minute ride to the trailhead, gaining plenty of Ogden history knowledge from the owner’s stories on the way up. The three-mile round trip hike and 1500 foot elevation gain is accommodating to various skill and fitness levels. We stopped for group shots and selfies at the 200 foot waterfall, before heading out with our young guide over large spaces of rock talus, to a lesser known area of jagged quartzite mountains. Most of us were hikers, so we opted for the third iron road route — also the longest — which we were told boasted a more advanced climb and a very scenic lookout over Ogden Canyon. Waterfall Canyon may not deliver the thrill of suspended bridges or terror-striking cable hauls of the Italian Dolomites, but there were several steep overhangs and scrambles over slender ridges that gave my biceps a workout. With a fair amount of rock-climbing experience, I found it very easy to climb, and caught myself several times on my carabiner as I forgot to unclip and reclip over the pre-positioned cable eyelets. It may be too easy or a bit blaise for those looking for a harder climbing challenge, but for many the steep height elevation, and moderate fitness it requires, is thrilling. Overall, it was worth the drive, the camaraderie, and the fresh air. The clear 360-degree mountain views at the ridge were some of the biggest highlights, along with friendly and accommodating guides. I do think they could upgrade the tour, with a small lunch, or even a post picnic layout, but the route is accessible and the pace is slow and sustainable. It’s all about the vertical gains, and finding a climbing option that suits your interests and abilities. 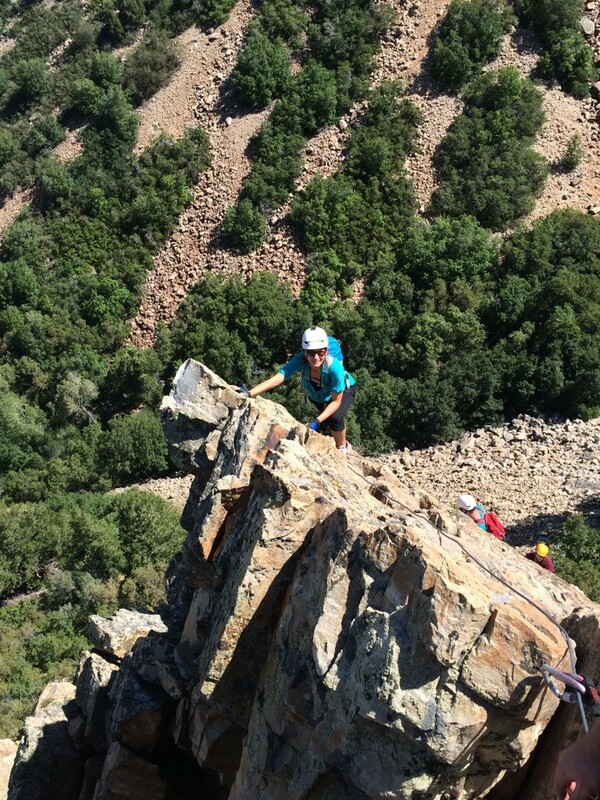 Love them or hate them, Via Ferrata open up new possibilities for exploring peaks. Though they may not gain too much expansion in the U.S., as we have a lot of protected land and would like to keep it that way. 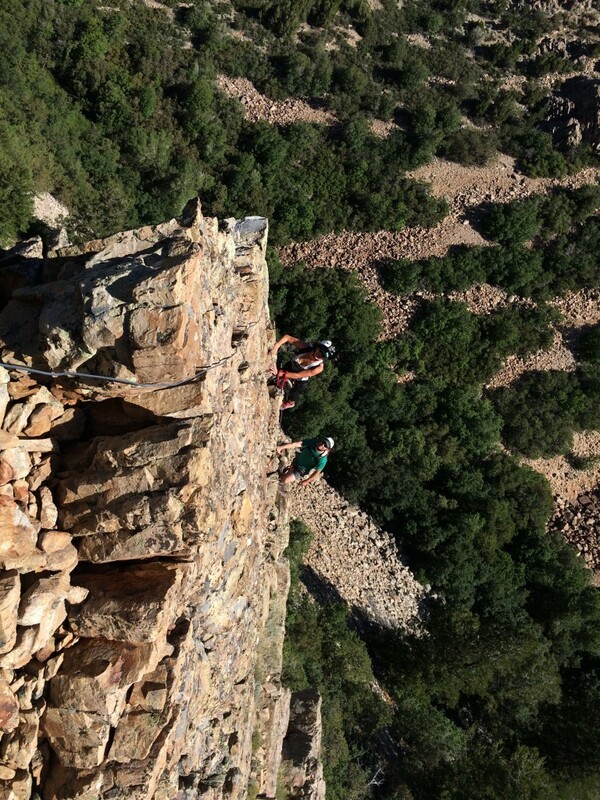 There is also a mindset of many avid climbers that feel Via Ferrata is cheating, or vandalism to rock faces. But I tend to agree with legendary mountaineering athlete Jeff Lowe, who has set astounding records and hiked the North Face of Mount Eiger, in Switzerland (one of the most dangerous mountain walls in the world) in winter, alone. He sees value in these few ‘Iron Roads’ for those with limitations, and a way to encourage people to get outdoors. 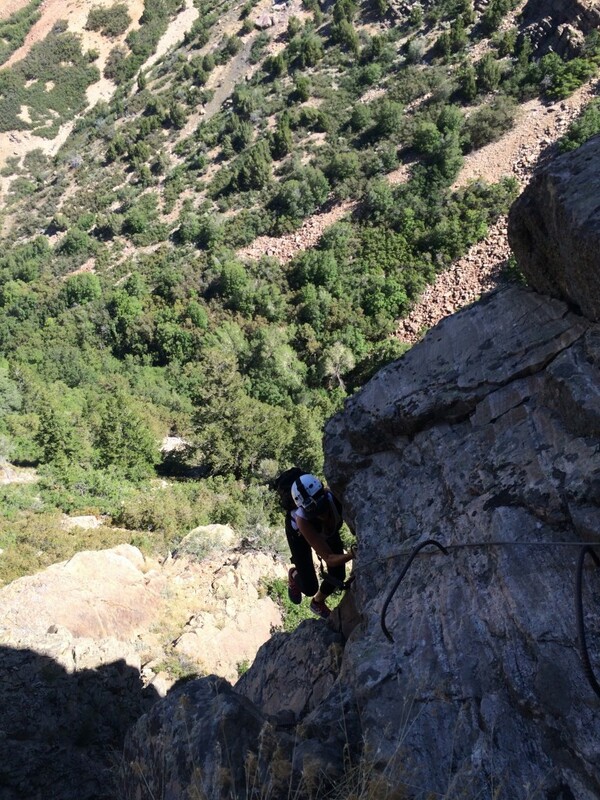 How to Via Ferrata: After harnessing up and securing your helmet, you attach both carabiners onto the wire cable. Each time you reach an “eyelet” placed in the rock, you essentially run out of steel cable, so you unlock and relock. One rule of Via Ferrata, you always individually unclip and reclip your carabiners, and have one carabiner attached at all times.